I received my order today of two name jigsaws. I love them. My granddaughters will love them too. You are a very talented craftsman. These have arrived today and are amazing!! Thank you very much I am about to order more and will be sharing your business with everyone. Again and again I come to Jim and his wonderful Jigzoo site for personalised and wonderfully individual gifts of beautiful quality that are made with such care. Always safely packaged and always given and received with huge pleasure Great result! Thank you for your brilliant service. Your work was well received. I thought you may like to see James as he opened it. Just wanted to say thank you so much for my recent order. I really appreciate you sending it knowing my time restraints. It got here on time for my nephews first birthday. The quality of the jigsaw was beautiful and everyone loved it. Will definitely order with Jigzoos again. Our order arrived yesterday and once again we loved it. Thanks for the wonderful service (what would we do without you). No doubt you will be hearing from us again soon. Beautiful and high quality. Not only that but Jim was a pleasure to work with and was amazingly helpful when there was a hiccup with international shipping. (Not his fault, totally on my end) Thank you! Our name plaques arrived and they are beautiful. We’ve ordered these as gifts a number of times. Your service, including order updates and fast delivery, is excellent. 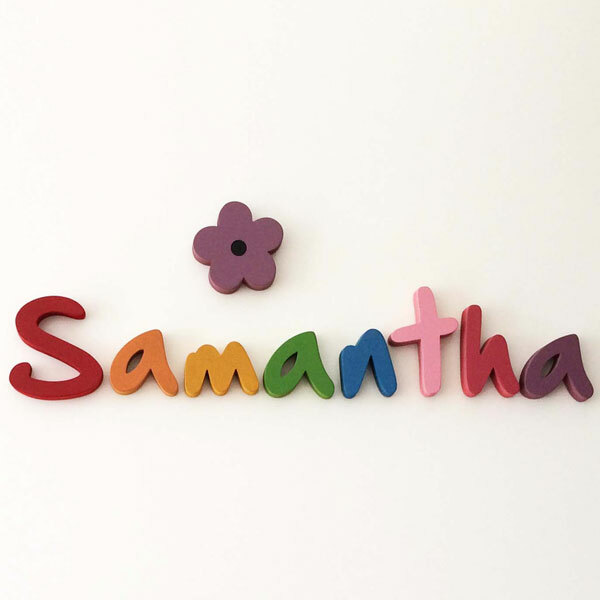 The name plaques are very high quality, look fantastic on the wall, and the kids love them. Fantastic item. I used it as a 1st birthday present and the parents loved it. The item was completed quickly and communication was spot on. I will be purchasing more of these when the time comes. I received the order today. They look fantastic – I’m sure the children will love them! I received the puzzles yesterday & they are perfect.. Received my order today – great product! That is what I call superior customer service. Hi Jim, The door sign has arrived and I just wanted to say how delighted we are with it! The quality of your workmanship is fantastic and your service and communication has been exceptional. 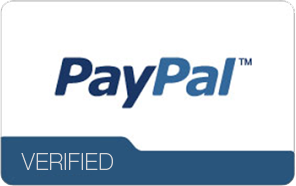 I will definitely purchase from you again and will recommend you to my family and friends. 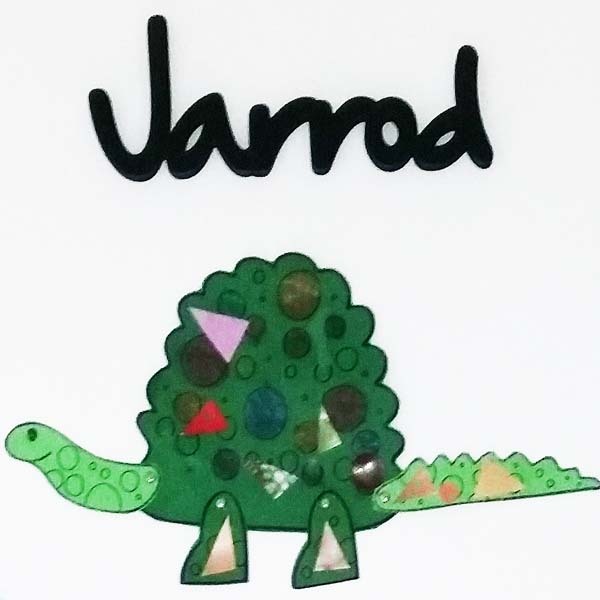 Most importantly, Jarrod couldn’t be happier with his door sign (see attached photo). Thank you for the beautiful jigzoo – it arrived safely last week. My niece will love this for her first birthday this week – it has been a tradition to purchase jigzoos for all of my nieces and nephews – there are 8! So glad that I found you online, as I have moved from the north coast to Dubbo, and can keep the tradition alive! Just wanted to say a very big thank you. My gorgeous parcel arrived and they all look amazing! As soon as i have given all my xmas gifts i will be letting everyone know about your fabulous website!! Jim I am absolutely thrilled with Blake and Rylans names. Thank you so much for the quick delivery. Just wanted to let you know how thrilled we were with your beautiful work. So were Alfred’s parents! I’ll definitely keep it in mind for future gifts. Good morning, I just wanted to let you know I received my order yesterday and everything was perfect. Omg…. I received my jig saw puzzle today for my daughters name and it is amazing, so happy with it, even hubby loved it too. So, thank you very very much for your service and I have already started recommending your work to friends and family. My order arrived today and i wanted to email you and let you know that i think it looks just fantastic. It is a present for my new nephew and i know my sister will love it just like i do. Thank you so much. Hi Jim, The puzzles arrived yesterday, they look fantastic!! Thanks so much! I can’t wait to give them to the girls for their birthdays. It arrived this morning Jim (in plenty of time for the weekend) and it’s PERFECT! I will be recommending these link letter puzzles and buying them as gifts over time to come. Hi Jim, Thank you so much for my order. It is just great and I am sure my niece will love it. I will definitely be ordering off you again very soon. Hi Jim, Received parcel this morning and am so happy with the letters. Glad I decided on the larger size. Thank you for your excellent service and I will highly recommend your business. Have a good day. Hi Jim, Sorry I haven’t got back to you sooner. 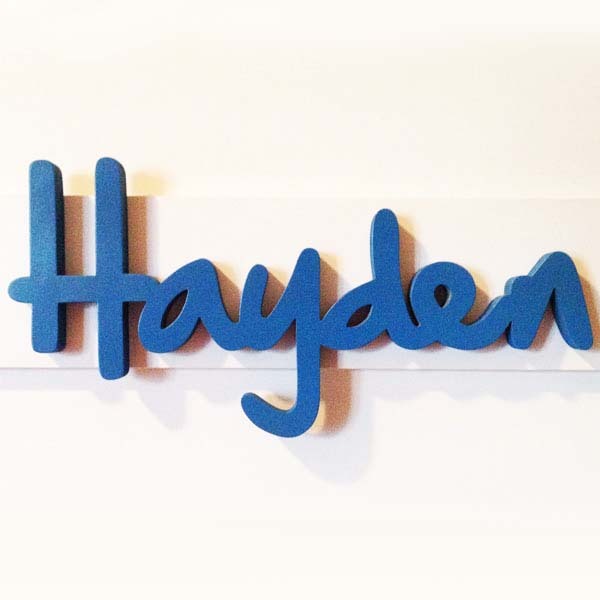 Thank you so much for the name plate, it looks excellent on the white door, Hayden loves it. Thank you Jim, I have already received my name puzzle & given it as a gift. They loved it. Hi Jim, I received the Evie puzzle today, it’s made so beautifully. Thank you for doing that at such short notice. I’m sure the little girl will have years of fun ahead with it. Jim, Received our order. It’s beautiful. Friends asked if there was a particular gift we’d like for them to get our children and we immediately thought of the name jigsaws. I was really impressed with the turn around time, the individual packing and the professionalism of the product. Looking forward to our kids getting to open them and putting them together. Thank you. I received my order and it is in perfect condition! Your work is beautiful. I can’t wait to see my daughters’ faces light up when they receive it for Christmas. Thanks very much. I will be telling my friends about Jigzoos. Hi, I’ve recently ordered a ‘Lauren’ name puzzle from you and it was PERFECT thank you so much!!! I will definitely be ordering again in the coming weeks. Fantastic service every time. Great quality products, my go to birthday present from now on. Thanks Jim! Hi Jim, Thank you very much for the puzzles. These are awesome. You have made Christmas so easy with such an awesome product. Very impressed. The puzzle arrived today & its really great. It will make a unique gift. Thank you for your professional service. Thanks for our order. It arrived yesterday and we love it. Your turnaround time is great, just over a week from order to delivery to Western Queensland. We’ll be recommending you to others. My plaques arrived today, just in time for me to pack in the car and take away. They’re amazing! Thank you very much for making them so quickly for me. You’re so fast anyway but I really appreciate you getting them off to me on Tuesday. Just wanted to let you know that my friend received the parcel yesterday and was thrilled. Hi Jim, My plaque arrived and is perfect! Thank you so much! Will order again soon. Thank you, thank you, thank you Jim! My parcel arrived yesterday and is fantastic. My kids absolutely love the elephant puzzle! My daughter Ava took it to kindy today for show and tell! I’ll be ordering again soon. Hi Jim, Just letting you know that the puzzles have arrived and look “fantastic”, thanks so much for such fast and excellent service. Will highly recommend to family and friends. Hi Jim, Just letting you know that my plaque arrived yesterday and it looks absolutely fantastic. Thank you very much for your extremely quick service and lovely looking product! Will definitely be in contact again soon. McDonald plaque received this morning – perfect. Thank you so much. love this name puzzle. very well-made, interesting jigsaw shapes, and the colors are lovely. gave this as a christmas gift and everybody loves it. in addition to a great piece of puzzle art, the shop owner, jim, is aces! there was a shipping delay on the u.s. side, and he was right on top of it to ensure that the package would arrive when expected and needed. really great customer service. would definitely shop here again. thanks! Thanks again for the wonderful service Jim. We received the names today & they look fantastic! Great quality & finish and they arrived so quickly! Your choice for Luke’s colors is perfect! Can’t wait to share them with my boys! I give them a special puzzle for each birthday—- if you have any other puzzles…. other than names.. let me know! I’ve shown them to everyone! I will be ordering some for my neighbors’ grandkids but will wait till after the holidays! I just wanted to let you know that I’m really happy with the puzzles! They’re really lovely and made so well. Thank you very much for getting them made so quickly also. Jim, you are a gem!! Thanks so much for my order! Love, love, love!!! And thanks for your awesome customer service. Just wanted to let you know that I received the two animal puzzles yesterday, they are beautiful and I am sure my little niece will love them. They are Xmas gifts for my nieces and nephews. You do great work and I love your products! I am sure that you will hear from me again. just wanted to let you know the order arrived and I am very pleased and impressed with the plaques and puzzle. I just wanted to let you know I gave the ‘Jayda and Piper’ name plaques to my brother and sister-in-law for their new babies today and they honestly loved them and were so impressed. Thank you so much for your friendly correspondence, prompt make/delivery and most of all the wonderful, well-made products I received. It was a pleasure to do business with such a great company. My order arrived today and they all look amazing! These were for godchildren and close family friends but I will definitely be back soon when we have kids of our own! Sorry for the late reply. We have received our signs and love them! I shall recommend you and use you for our next shop! I received Sophie’s puzzle thank you so much! It’s gorgeous!! I love your things I am going to get one for my son soon! My puzzle arrived today and it was perfect. As always the puzzle was amazing quality. It’s great to buy something a little bit different which can be customised and all at such a reasonable price. It has now become a ‘tradition’ with my sister and I that each of our children get a name jigzoos puzzle when they are born. Between the two of us this was the fifth one we have ordered! As always loved the final product. Thank you! I picked up the puzzles from the post office today. THANK YOU, they are WONDERFUL! So happy with the quality & colours are lovely. And your customer service; emailing & post, just fantastic. I’ll be ordering a few more soon. Thank you so much for the gorgeous Linkletters. I received my ‘Bodhi’ and ‘Archer’ yesterday; they are a gift for a friend who’s just had twins. They are just divine and I’m so excited to give them to her. Loved the speediness with which they arrived too! I received my order today & everything was just amazing! Thank you so much I am very happy. I would recommend you to anyone looking for a product like this. Thanks for the Fantastic Plaque you sent us for Olivia (Lavender) recently Looks fantastic on her bedroom door. I’ve liked it that much that ill be ordering for my 2 boys shortly, ive also posted your link on my facebook page, so be prepared for some extra business. The parcel arrived today, they look fabulous. Thanks a billion!! I received my order last week and thought I would let you know that I was very happy with the puzzles. Thank you and I will definatly will be ordering from Jigzoos again. Two more Christmas presents for the grandkids – their Mum was here today and even though this pair are 16 and 13 their Mum said they would love them. The other three plaques arrived and I was thrilled to bits with them, the girls will get a lovely surprise on Christmas day. I highly recommend this site .. I ordered 4 names and they are perfect in every way .. the quality.. the price .. exceptionally fast delivery ..
Thankyou so much for our unique jigsaws. We have been so impressed with your prompt, professional service and how easy the communication and details are sorted. We will definitely be spreading the word so no doubt you will be receiving a few more orders from down South in Tassie! I know my sister is already keen to get her children one and I will think of you again when in need of an original gift idea again! Once again, many thanks for a beautiful and much appreciated gift. I just wanted to say thankyou. I received my order this morning. It is perfect. I cannot thankyou enough. I will definetly be ordering more things from you. I wish you continued success in your business venture. thank you so much for your personalised service and I look forward to further purchases! I just wanted to say a massive big thankyou. I got the name plaques in the mail today and they are perfect. Thankyou for the great work and the fast service and delivery. They have arrived and they are just beautiful, thank you so much you are very talented. I will be placing another order very soon for birthday pressies. The 2 name puzzles I ordered have just arrived and they are beautiful. Thank you once again for your professional prompt service. My order arrived today and we are very happy with the puzzle & name plaques. Thank you for keeping us up to date with everything; always great to deal with a well run business! I will be recommending you to my friends & family. We received the plaque and it looks amazing! Thank you so much and I will definitely order from you again. I received the name plaques today. I’m really impressed with the quality and they look fantastic! I’ll certainly be purchasing items from Jigzoos again and will be recommending you to my friends. Mine arrived today – THANKYOU, they are beautiful. My boys loved them too and keep going to their door pointing at their names. Highly recommend you guys! I wanted to let you know that I got my name plaques the other day and they are AWESOME!! Thanks so much for the great job and high quality work that you did. Fast delivery as well! Maura & Osten loved them! I would recommend you any day. They arrived today – beautiful and well packaged for protection! Thanks they are so special and will help my kids feel welcome in our new home! Just wanted to say thank you for my parcel which arrived yesterday. I am absolutely delighted with the result and am sure all the kids I bought one for christams will love them too. I only wish I had more to purchase for right now! The quality of your workmanship is outstanding and I was even more impressed that each one was wrapped nicely all ready to go, such a bargain! I can’t believe you managed to do so many and have them posted in such a short period of time – fantastic turnaround. You can be sure I will keep your site in my “favourites” bar for future reference & recommending you (although I’m not sure I want to share such an excellent source for my gift giving ideas!! lol :). Thanks again and I’m looking forward to seeing the reactions when the kids open them for christmas! Love the plaques – Thanku. Recipient sent me photos. Both of us Very happy. Just wanted to send you a quick email and let you know I got my delivery. Thanks so much – they are great. You will definitely here from me in the future. Just letting you know my puzzles arrived! OUTSTANDING! I’ve been ordering your beautiful jigzoos and linkletters for years now and yet I am still amazed at their beauty…rest assured I’ll definitely be ordering many more! Thanks for ur excellent products and services! Just to let you know the parcel arrived today, we are thrilled with the name plates, you will probably be getting more orders from this address, as quite a few of the girls have seen ours and we have given out your website address. I received word today that the letter puzzles I ordered have arrived safely. Apparently, the reaction from Megan (who is sometimes known for her colourful language) was “friggin’ awesome”. A satisfactory reaction from a new mother! Thanks Jim for all your help and professionalism. I received my beautiful parcel today, thank you! They are absolutely gorgeous. I can’t wait to give them to their special owners. The Link Letters puzzle and 2 Jigzoos that I ordered arrived safely today. Like my previous order, these are excellent: they’re beautifully made with fantastic colours. I have shown them to my friends here at work, and they also think they’re great. I am sure my niece (and her parents!) will be delighted with them! Received the plaques today, they look great, am sure the girls will love them! I have just received our “Tyler” puzzle. It looks fantastic! You have a great product. I received the plaque yesterday afternoon and I love it!!! Thanks So much, it looks perfect…. The puzzles arrived today – thank you so much! The birthday girls will love them! I found out about your puzzles when I was given one for my daughter. Great idea. Will definitely be ordering more in the future. Our name plaque arrived yesterday and it is absolutely gorgeous, we totally love it. Thank you. I will definately be in contact again. Just want to say i LOVE the name plaque you made for my daughter Lacey, it’s awesome!!!! Just wanted you to know that I received Montana’s puzzle today and it is FANTASTIC !! Thank you very much – and just in time for her 1st Birthday. Just wanted to let you know that the puzzles arrived last week and I loooooooooove them! I gave one of them as a birthday present on the weekend and it was a huge hit! Thanks again and I’ll be sure to place some more orders prior to Christmas! The plaques arrived today and they are fantastic! Thanks so much, can’t wait until the boys come home from school and see them. Thank you so much for Thomas’ name puzzle. He opened it on Saturday and loves it! Hasnt worked out how to put it together yet so theres a challenge for him! But he is loving trying! The puzzles arrived this morning. They are absolutely beautiful. Thank you for your fantastic service, too. I will definitely be recommending you to friends. We received our plaque yesterday. Thank you so much – we love it!! Puzzles arrived this morning & are beautiful. Thank you so much, I will be recommending your business to all my friends & am sure I will be ordering more in the future. Just wanted to let you know that I picked up plaques from post box yesterday. My friend LOVES them. Thankyou so much, she is very happy. Just letting you know that the name plaque for my bestie’s baby, McDonald, arrived today. It is absolutely wonderful. Everyone loves it, it looks great on his wall! Thank you for making it, I am so happy I found your ad on fb, as you know, none of the other name plaque companies would or could make his name with the capital D in it. I received ‘Charlie’ in yesterdays mail….once again, I’M SO VERY PLEASED!!! Its just beautiful and I cannot wait to give this as a gift to a friend for her son’s 1st birthday!! I’m hooked now! (don’t even have one for my own son yet!! )… so I will place another order in the near future! Thanks again for your wonderful service and great communication. Credit to you for such a fabulous business!!!! Look forward to doing business with you again. I received my puzzles today and they are perfect. Thank you for doing them so promptly. I will certainly be using Jigzoos again!!!! I collected the Kyla plaque yesterday. I love it, it is perfect! Andrea has received the plaque and she LOVES it. Many thanks!! I just received my link letters. They are fantastic! Thank you very much I will be ordering more in the future for sure. I can’t thank you enough for the puzzles. They are absolutely gorgeous! The quality is fantastic and my little girl just loves putting her own name together. We gave her friend one for her birthday as well and she thought hers was great too. Such a novel idea. Thank you also for the great turn around time. I had it in my hand within a week. Thanks again. I will definitely be recommending you to all my friends and buying from you in the future. Just wanted to say Thank you they arrived today and they really are lovely, not sure I want to give any away as gifts, will be passing your info on to all my friends. I received the puzzle yesterday and I love it..!! The whole process of ordering to delivery was so quick and easy..!! I can’t wait to give this to my niece for Christmas..!! Just to let you know, the order arrived on Friday and they are all really lovely. I think I’ll be ordering some more shortly. They look much better in reality than the photos on the website. They’re great. I received my parcel yesterday! Thanks so much – they are just beautiful and I can’t wait to give them to my little girl for Christmas. I may be back with another order for my nephew, too! Received puzzle yesterday thank you so much its awesome. Am sure I will be in touch in the future with being such a unique item they will make great presents. I was given them as a present from my sister for my two boys when they were born and I really liked them. Such a unique gift. My nearly five year old and three year olds still play with them! They are more beautiful than what is shown via the images on your website. Your puzzles arrived this morning, thank you so much They’re beautiful!! They easily arrived on time and were beautiful. Our girls love playing with the animals. The puzzle arrived today, I was very pleased with it and know my grandson will enjoy playing with it. Just wanted to let you know the puzzles arrived today, they are gorgeous, thank you!! I received my parcel today. They are AWESOME! Thanks Jim for the 2 puzzles. They are just gorgeous and Jack’s family loved his for his 1st bday. I will definetly recommend you and be ordering off you again in the future. Thanks for getting them to me ontime too. I got all the puzzles thanks! They are freakin’ awesome!!! Cheerio & have a great weekend! Received my order today thank you….. what a wonderful item!!!!! I am a very satisfied customer!!! Credit to you also for great communication and prompt service!!! I will highly recommend your business!!! Thankyou so much, I received the puzzle yesterday & I am so happy with it! Thank you so much for getting the puzzles here on time at such late notice. They look fab-u-lous! I know that all three will just love them. Looking forward to the next kids birthday that we have, as you’ve made buying a present so much easier and enjoyable. We have received the puzzles and they are lovely. Just a quick note to say we received our puzzles in the mail today. We are very happy with them. They are delightful and am sure the kids will love them too. I love it. I will definitely be ordering more of these. Thank you for getting it to me so quickly. The quality is fantastic. It is such an original gift and I love finding different things. Not sure I want to spread the word, want to keep the idea all to myself! Got my puzzles today. Thank you so much they are just lovely!!! I will be recommending your linkletters to all my friends. Job well done, they look fabulous! I have received the puzzles today. We like it very much. Thanks for everything. Will recommend to others. The puzzles arrived today – they’re perfect. My Oliver loved his and I think I’ve found my new favourite baby gift. Sorry in the delay in letting you know I have received the 4 name puzzles I ordered last Friday. They are absolutely gorgeous, thank you so much. I will have another order closer to Xmas. Just wanted to thank you again for the puzzles. My friend loved them. They made a wonderful gift. I received the puzzles today. They are beautiful – thank you so much. Hope to be in touch again in the near future. I appreciate the very quick turnaround. Thanks for starting on the job even before receiving payment. It’s nice to know there are still some trusting people in the world! Just wanted to let you know that my name puzzles arrived today and they are just perfect.. I will keep your email as i will be ordering more very soon..
Thankyou so much – they arrived this morning and they are gorgeous! The letters arrived the following day. Thank you for your prompt service and excellent product. I’ll be highly recommending you to friends and family. Milla arrived today & it is fantastic, even nicer than its picture. Just a little note to let you know the puzzles arrived safely today (12/11/09). They look absolutely wonderful, thank you! And thank you also for the speed in which you made and delivered them; that was fantastic! I will have no hesitation in recommending your business to others, and I am sure I will be ordering more in the future. In the meantime, best wishes for the holiday season ahead, and with the success of your business. We received the puzzles and they are fantastic. The parents of the triplets loved them too. Thank you for your assistance in making them and getting them to us. Just received the linkletter puzzles & I’m very happy with them. I can’t wait to give them as gifts! I’m sure I will be ordering more in the future. The parcel arrived to me this morning. They are very well designed. I like them being chunky and being able to stand alone, even the baby pieces. I found the following on a puzzle forum. I’ve used jigzoos.com.au heaps of times. Their Linkletter name puzzles are a little different to the one on the mooo site, but they are just gorgeous – they are 3-D and stand upright. You have so much choice in colours, can even create your own colour scheme and they are only $4 a letter. I also like that they are hand-made in Australia. I’ve been so impressed with Jim and his work that I have given them as gifts to friends’ kids overseas. and now have two nieces to buy for in a different family. Rikki and Milly. I am so impressed with your designs and do not want to go elsewhere. By the way, I spent a long time on the internet as I couldn’t remember your company name. Other puzzle companies do not compare to your work. Hoping to hear from you soon, I am hoping for these as x-mas gifts this year. I received the order yesterday, and yet again they are fabulous! Thanks so much they look great and im really excited to give them as gifts! Be in touch when some more babies arrive!! I must say my family loves their names puzzles and everyone has them on display in their rooms and always receives wonderful comments about them. Both my sister -in-laws have been asking for these puzzle since they’ve have had their other children, so these will be a wanted Xmas presents! Thank you for the wonderful job you do – you enrich our children’s lives in such a great learning way!! my 4 year old, Abigail has learnt to write her name with the help of your letterlink. just a confirmation that i have already received the linkletters on friday. thank you so much for the beautiful linkletters. last year i’ve ordered for the first time for my kids and so pleased with the result. that is why i was ordering again for my nieces’ 1st b’day. will definitely recommending your linkletters to my circle of family and friends. I received the puzzle today. I think it’s fantastic; I’m really pleased with it! Thanks for painting the letters in the colour gradient that I was after, too! Puzzles arrived today and they look awesome – than you so much! The nieces and nephews will be so happy! We just received our Jigzoos and Linkletters. They are fantastic, our little girl was into them straight away !!! Thank you for such a wonderful product and for these very well made puzzles. Just a note to let you know that I have received my order and that I am very pleased with both the product and the prompt service. I would be very happy to give my friends a verbal recommendation based on the service I have received. It’s such an unusual thing these days to order something from somewhere and receive it without any problems. A pleasant surprise I must say. Love them, love them love them…. the parcel arrived today! They are fantastic thankyou, better than i had imagined. Everything is in good order and thank you so much for getting them to me before the weekend! Just wanted to let you know I received the puzzles today and am thrilled with them. I received the puzzles yesterday and they are awesome. Thankyou and I’ll definitely be ordering some more in the future they’re excellent quality. Thank you for the puzzle which I received today, it was of the same high standing of all the other puzzles I have purchased from you on other occasions. Thanks for the puzzle. It is fantastic. It is the second one we have ordered from you, and as with the first one, we just love it. It is the perfect welcome home gift for our daughter. Thanks once again for a great job and quick, quality work. The name puzzle and jigzoos arrived this morning to my daughter’s delight.She is having an absolute ball playing with them, and is thrilled to bits. 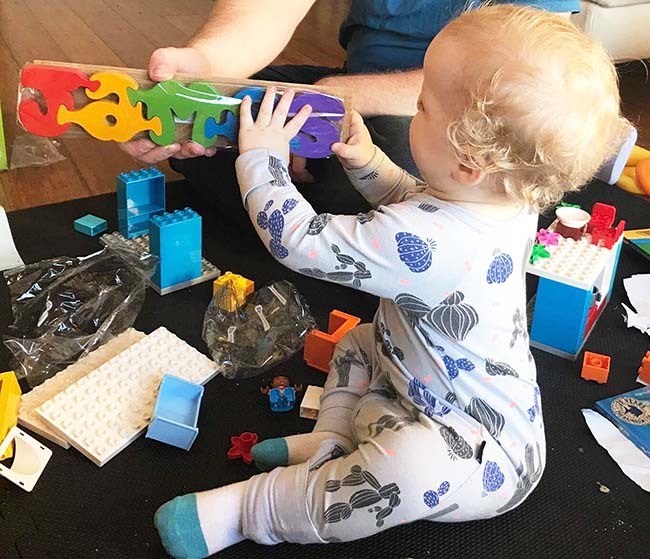 I’d like to add that the puzzles are of superb craftsmanship and I will be recommending them to my mother’s group and anyone else who has toddlers. Many thanks also for accommodating my postal requirements. You provide a sterling service through your work and communication – from beginning to end. The puzzle is beautiful. It arrived early this morning and I am so pleased with it. I love the quality and colours. My father-in-law is an ex-engineer and he thinks it is beautifully made (which is really saying something, as he is a bit of a perfectionist!) He was wondering how you cut the shapes because they’re so smooth and even. Thank you for the fantastic product and the really speedy delivery. I’m sure my little neice will love it. You have done it again. My Linkletter puzzle for my newest grandson arrived this morning. Again thank you! I have been telling everyone I know about your excellent products, service and price. I will be ordering more in the new year. Well my Linkletter name puzzles arrived about 10 minutes ago, they are Great!!!! To date I have only ordered two, but I will definately be ordering more. The product is excellent value for money, the service terrific, I could not be happier! You should be very pleased with yourself! I’ve received the puzzles today. my kids was so excited that they just can’t stop playing with it. i also would like to say thank you for the beautiful puzzles. it is exactly to what i’ve imagined. I will definitely recommending your work of art to my friends and families. Just wanted to let you know that I received the puzzles late yesterday…. They are fabulous! I cant believe how lovely they are – and you made them so quickly! I had ordered 2 puzzles (the flat board type) from another lady in Melbourne back in late June, and can you believe I still only have half of them delivered! She has taken forever, and still her quality does not come close to yours! Received the puzzle. Word of mouth is the best for small businesses. I found out about you because my daughter got one for her 1st birthday and the one I ordered is for a friend’s daughter’s birthday. I will keep spreading the news on how great they are and the fantastic service you provide. We’ve got a few birthday parties commng up and I’d like to order some more linkletter puzzles. Two of the names are quite common, EMMA and WILLIAM. The other name is POPPY. I’d like this in rainbow colours with a purple heart at the end. By the way, the Sjoerd, Mette and Lena puzzles that went to the Netherlands were a hit. Everyone was absolutely delighted. My 2 puzzles arrived today. Thank you very much, they are beautiful. I am using them as a Christening present and I’m sure they will be loved. Thanks so much for my order. They are just perfect. I can’t wait for the birthdays to roll around and give them to the kids. I received your parcel this morning and was delighted with the contents. I must say that the quality and workmanship is superb! My husband kept looking at the pieces and couldn’t stop raving about how well they were made. I’m sure our neice will enjoy her gift thoroughly. I’m tempted to open the packaging and play with them myself. Thank you so much for everything, much appreciated. I should also mention that the turn-around was very quick. I hope you had a great christmas. I wanted to let you know that these arrived in time – with a few days to spare actually. Thank you so much for all the effort you put into them – a great job as always. The puzzles were loved by both the boys, and most importantly impressed their parents! You’ll probably be hearing from me again in a few months time to order another puzzle. I received the “Alex” puzzle yesterday. It’s fantastic! Thanks so much for your attention and quick shipping. If I ever need another puzzle, I’ll definitely know where to go! A quick note to let you know the two linkletter puzzles have arrived. They look even more beautiful than I had imagined. Thank you very much for your wonderful work and very quick delivery. It was a pleasure to purchase your puzzles. I will ‘bookmark’ your site and remember you for future presents. We’ve just received the snakes puzzle today, and it is beautiful. My daughter is pleased, as well. Thanks for shipping it all the way over here for us. Just wanted to thank you again for the puzzles – they are great and the service is truly unbeatable. Will definitely recommend to anyone who’s is after that ‘something different’ gift! Thank you so much for the puzzles.They are beautiful! Thank you so much for the wonderful name puzzle (Xavier)! It arrived on monday and since then everyone who has visited has seen it and loved it…I purchased it for a friend for her new baby and I am sure, once I give it to her, she will love it too. I will definatly be ordering from you again in the near future . Just a short note to let you know that I received the puzzle last week. It is truly gorgeous – I am just sure that Declan (my little “puzzle rat”) will love it when he receives it for his birthday next week. Thank you again for such a lovely gift and easy purchase process. Just wanted to let you know that the puzzle arrived today and it looks great! I’m sure my son will adore it! You have done an excellent job! I know I will be ordering from you again in the near future! We got the name puzzle and it is awesome!!!! !WOOHOO! Gear yourself up….. there will def be more orders coming your way, really soon. Thanks so much for the Natalie name puzzle in 3 shades of green. It was perfect!!!!! My name is Elizabeth and I just wanted to send a quick message to let you know that we bought more of your puzzle names at the markets this week and I just love them!! My boys have their names up in their rooms and so do my friends now! I am going to place another order for my sister in law who lives in Sweden because I am sure her boys will love them also. We have a range of your names and puzzles and we love them. You are doing a fantastic job, I’m glad I found you while my kids are young enough to enjoy them. Thanks for the great work. My 1yo daughter received a name puzzle for her 1st birthday and we loved the idea.My husband was rather tickled by it so I would like to order him one for x’mas for his desk at work. His name is EDWARD and I would the puzzle to be in blue, red and yellow. The puzzles arrived on Friday. They are better than I had hoped, I will reccommend them to many friends. I am so impressed with the quality of the jigsaws that I want to order some more. with thanks i received my order today – i’ve purchased this for a gift for a friends baby girls christening, she’ll love it like i do, i think it’s great.i’ll definately tell my friends of you, (i may in the future even get them for my little ones lachlan & tara). Just wanted to express my thanks. I received the puzzles in today’s post and they are absolutely perfect. Thank you so much for your prompt delivery and wonderful service. Your service and product are great, I’d like to order another puzzle please, primary colors NATASHA. I ordered a couple of names a few weeks ago and loved them! So I would like to order a couple more, although one is a little difficult. His name is Loic with two dots above the i (its French). The other is Noah. Recieved the puzzles yesterday when i arrived home from work, they are great, exactly what i was after!! Showed my mum and she said they were great and is thinking of purchasing two for my little twin cousins, so you’ll most likely hear again from me shortly!! The puzzles arrived on Wed. They are fantastic – not that we expected otherwise. Hamish couldn’t believe it was “my” name and his favourite colours. The snake & croc will be a huge hit at Easter. Just wanted to let you know that I received the Elke puzzle in the post today. Hopefully she will love it (when she is a little older – she is only 1 month old). Her big sister Hannah, loves hers (we bought hers in March this year). Also may I order a “HOLLEE” Primary for delivery before 22nd July? Sorry about the short notice but your puzzles are great and I would love to give them as birthday presents. I’ll pass the word around about your beautiful puzzles! Just to let you know that the little girl I ordered for in Singapore loves your product – a kangaroo. Some nice feedback for you.